Germano Almeida is a Cape Verdian writer that studied law in Lisboa ,and a champion of his homeland Cape Verde and its struggles after independence when it fell under a one party system he user humour and satire to do this .The book starts as a group of people to hear the reading of the will of Napumoceno Da Silva Araujo ,he was a respect store owner and stand up figure in Cape Verde ,But little do the people realise his will is 387 and all of it has to be read aloud as the reading unfurls the history of senhor da Silva and the island he grew up on ,his loves loss people he meet and thing he did ,his foibles ,a illegitimate child ,the face of this respect business man is changed for ever in the people gathered there .but we also learn how generous he was to his fellow islanders he love to be a kind benefactor ,He loved to drive his Model T ford that was the islands first that he had specially imported for himself . The reading of the last will and testament of sr Napumoceno Da Silva Araujo ate up a whole afternoon .When he reached the one hundred and fiftieth page ,the notary admitted he was already tired and actually broke off to ask someone bring him a glass of water ,And as he sipped it ,he complained that deceased ,thinking he was drafting his will ,had instead written his memoirs . the opening of the book . 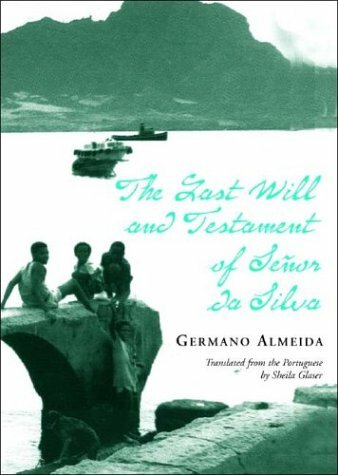 Almeida seems to have brought humour and thoughtfulness to the story of Senhor Da Silva Araujo ,as the will unfolds the character leaps of the page ,a larger than life businessman ,and what drove him to write this will come memoir .As he wants to make his mark on the world and this will he wants to be his lasting testimony to who he really was .Part of me wonders if this is a Cape Verdian tradition this will come life story ,I hope it is what a way for family histories to be passed from generation to generation by written and oral readings ,Almeida is a lawyer so I wonder if this is a combination of various people he has had dealings with as the main character seems so believable .The book is Published by New Direction the US publisher ,I was sent it by My good friend Simon over at insidebooks that also read and reviewed this book a while ago .The translation is one of these best Portugese translation I have ever read and was masterfully done by Shelia Faria Glaser.